No change in the first day's dressage leader at Badminton, but some changes in the top ten, although our New Zealand riders competing on the second day couldn't bust into that top ten. The two days of dressage in great conditions at Badminton Horse Trials have concluded with Michael Jung and La Biosthetique Sam still in the lead. No one riding on the second day was able to head him off, but Emily King, riding here for the first time ever, and the youngest competitor in the field, made the best attempt. Her score of 36.8 on Brookleigh has put her into second place. Her mother, Mary, won the event in 1992. None of the New Zealanders riding on the second day made a dent in the leaderboard but there are four in the top 20 after dressage. Five if you count Oliver Townend’s horse, Black Tie, who is a New Zealand thoroughbred! Owned by Oliver and New Zealander Karen Shuter, he is in eighth place after dressage. Clarke Johnstone has showed that his consistent marks received in New Zealand and Australia on Balmoral Sensation are valid and that Ritchie can more than hold his own against the best in Europe and UK. They have finished in ninth slot after dressage, closely followed by Jesse Campbell on Kaapachino, another New Zealand thoroughbred. Both are making their Badminton debut, so should be very proud of their first-phase efforts. Even competing here has been their dream since they were riding at pony club events. Jonelle Price was next out on Classic Moet. Her test looked great in parts, the trot work the highlight, and her score of 47.3 leaves them in 30th position. Jonelle may take a little consolation in that she did beat her husband, Tim who is on 47.4 and into 31st spot. However, this is Badminton, and people have won the event from even further down the leaderboard than the Prices are. The judges were very consistent with Jonelle’s marks, but with Tim’s there was a 12-mark difference between the scores. Tim’s halts caused him (and the judges) some grief. “It started with a halt that didn’t stand still. 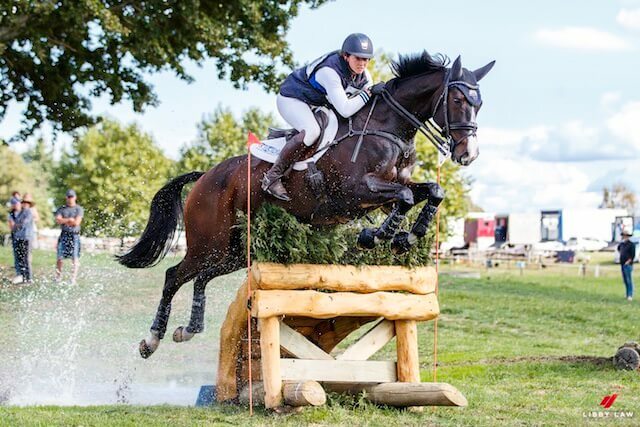 It got a bit better as we went but there is a halt in the middle that he didn’t maintain either and at the end of course.” Tim, obviously disappointed, knows the horse is capable of better, having scored a 38 at Burghley last year. Lucy Jackson’s Bosun did not impress the judges and their mark of 60.1 leaves them in 74th place and with a lot of work to do in the next two phases. The course is about a minute longer than it was last year, so horses’ fitness levels are going to be crucial and time penalties will no doubt be added to many people’s dressage scores. The cross-country starts at 10.30pm New Zealand time. Lucy Jackson, Bosun, 60.1, 74th.